Lee un artículo que describe el tiempo en la ciudad de Chicago. Describe el tiempo en tu país o región. 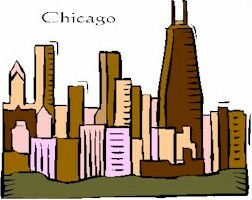 Chicago, where I am from, is called the "Windy City." In the winter a cold wind blows off Lake Michigan and it snows a lot. The temperature gets very cold, sometimes below zero. In the spring the weather is great. It's warm and the snow melts. People plant gardens and start to play outdoor sports like baseball. In the summer it's hot and sometimes humid. People swim and turn on their air conditioners to keep cool. Sometimes it rains or we get thunderstorms. In the fall it's cool. People prepare for winter and buy warm clothes like coats and hats. The leaves change colors and fall from the trees. It's very beautiful. Selecciona la estación correcta para cada pregunta. 1. When do the leaves change colors in Chicago? 2. When is it humid? 3. When do people plant gardens? Describe como es el tiempo en tu país o región en las diferentes estaciones del año. Escribe la "Lección Escrita" en la sección para comentarios abajo. Inglés Mundial es una comunidad de personas que quieren aprender inglés gratis. Ayúdense unos a otros y si ven un error en la escritura de otro, respondan con la corrección. Para aprender de errores comunes, sigue la página de Inglés Mundial en Facebook, Google+, o Twitter.